Recommended to: Those who enjoy a feisty female lead, and a read with ample adventure. An enchanted flute that vibrates when danger is near, sparkling mist that unlocks a drawer of family secrets, and a bookcase that expands to conceal her hiding place—these are the bits of magic Lucy P. Simmons has experienced since her parents drowned at sea. 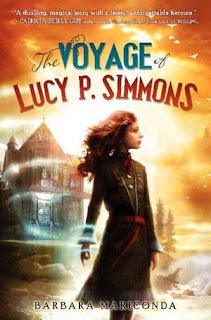 The magic is helping Lucy keep her house—Father's beloved "ship on shore"—out of the hands of her greedy uncle Victor. Lucy thinks the magic is coming from Marni, a mysterious woman who seems to be one with the sea itself . . . and who bears a striking resemblance to the mythical siren in the painting in Father's study. Together, Lucy and Marni devise a plan to stop Uncle Victor's conniving ways. In the process, Lucy makes unexpected friends and discovers that courage may be the most powerful magic of all. But will it be enough to prevail in the face of her evil uncle? Barbara Mariconda's beautifully written and timeless story overflows with dazzling magic, swashbuckling adventure, and good, old-fashioned heart. In the vein of a Lemony Snicket novel, The Voyage of Lucy P. Simmons opens with tragedy. Lucy's family is taken from her quite suddenly and her evil Uncle Victor comes to live with her as her legal guardian. His plan is to take over her family home. What is a young girl to do to fight back? Although the book opens with a rather sad note, I can tell you without a doubt that once it takes off it's hard to stop reading. I was simply disappointed by the lack of answers upon ending Lucy's story. The magic in this story is dazzling, but never really explained. We meet some wonderful characters during our romp through Lucy's life, but we never really see into their pasts. I'm hoping that this means this is the first of the a series that will eventually wrap things up. I for one will be happy to follow Lucy to wherever she ends up next!